This image showing the solar corona up the distance of more then 12 solar radii is a composition of totally 98 images. 63 digital images of inner corona were taken with F8 500 mm Maksutov-Cassegrain. The outer corona was recorded on 27 one second long exposures taken on classical 800 ISO negative film with F2.8 200 mm lens. 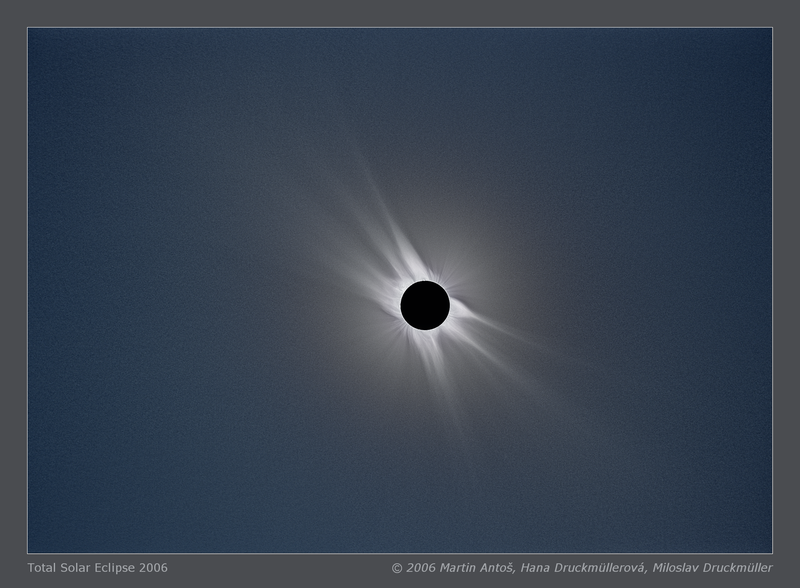 Another 8 images on the classical film with exposure range from 1/125 s to 1/2 s were taken in order to make the alignment with digital images of the inner corona possible. The success of this carefully prepared plan was nearly a miracle. The sky was partially covered with cirrus clouds during the totality (see wide-angle images), fortunately the sufficient large neighborhood of the Sun was clear. Click on the image or on the following reference to display the higher resolution image version (4.5 MB, PNG format). Processing Composition of 98 images (63 D, 35 A). Images were aligned by means of phase correlation, composed using of LDIC 4.0 software, processed using Corona 4.0 in order to visualize coronal structures. Final processing was done using ACC 6.0 software. Orientation Image must be rotated 43.40° anti-clockwise to achieve standard orientation i. e. North up.